Provide comfort for the family of Roger Favaro with a meaningful gesture of sympathy. Roger W. Favaro, 87, of Dannemora, NY, passed away on Thursday February 7, 2019 at his home. He was born in Saranac on March 6, 1931 the son of Charles and Mary (Ducatte) Favaro. 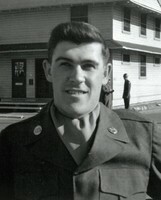 Roger served his country in the United States Army. Following his honorable discharge, he married Marlene Dame at St. Joseph’s Church in Dannemora on May 21, 1952. He retired from Clinton Correctional Facility after 35 years. He was a member of St. Joseph’s Church. Roger was an avid baseball fan, playing both baseball, softball and cheering on his Boston Red Sox. In his free time he often enjoyed being with friends and his wife playing cards, horseshoes, fishing, hunting or snow-mobiling. He loved to camp with his family or take them to Fenway. He was always his children and grandchildren’s greatest fan, attending all of their sporting events. He was predeceased by his parents, and his wife Marlene. He is survived by four children and their spouses: Bruce Favaro and his wife Dawn (Frenyea) of Saranac, Gayle Porcelli and her husband Joseph of Plattsburgh, Karen Favaro of Dannemora and Susie Ryan and her husband Jim of Dannemora, seven grandchildren; Ryan Favaro, Erica Lindsay, Heather Stone, Anthony Porcelli, Kailee Favaro, Jason Favaro and Carson Ryan, five great-grandchildren: Madeline, Brady, Barrett, Noah and Micah, his sister-in-law and brother-in-law, Paul and Joan Corbin, his nieces: Chantal Corbin and Danielle Kabinoff and his Shih-Tzu Molly. Calling hours will be held on Monday, February 11, 2019 from 10:00am-11:00am at the St. Joseph’s Church in Dannemora. A Mass of Christian Burial will follow at 11:00am, burial will be in the parish cemetery at a later date. The family would like to thank Faye and Gloria for the excellent care Roger received. To send flowers in memory of Roger W. Favaro, please visit our Heartfelt Sympathies Store. Provide comfort for the family of Roger W. Favaro by sending flowers. On behalf of the Seton Catholic family of faith, I would like to extend our deepest sympathy to Roger's family and friends. May he rest in peace and may the angels lead him to his heavenly home! Bruce, Gayle, Karen and Sue, My heart goes out to you and your families on your Dads passing. I’ll always have great memories of all the fun times our families had together while we were growing up. Roger was kindhearted, funny, and everyone enjoyed being around him. I’m so thankful I just had the chance to visit with him again. I’ll miss him and I’m sure he will be deeply missed by all of you. Our family is keeping your family in our thoughts and prayers. Our sincere condolences to Roger’s family. I will always remember the good times we had with Roger, Marlene and the kids. The family picnics, ballgames and family events we shared were always so much fun. Roger was always such a kind, caring person to all of us, he seemed like a second father. We will miss him very much.